Since 2011, we have been the Central Virginia helical pier installer for AB Chance foundation systems. Over the past 5 years, we have seen many of the same problems, and also some unique situations that keep things interesting! Earlier this year, we installed 19 helical piers on a residence in the east end of Charlottesville. Nineteen piers is quite a lot on a single family residence! In this case, the entire backside of the house had settled, resulting in the need for so many piers. At the helm of the mini excavator, owner David Reynolds prepares the landscaping for helical piers. We think this problem was caused by an air conditioner condensation pipe that we found under the deck. Buried just above the ground under the deck, this pipe was unnoticed and likely pumping water under the deck with no where to go. As you’ve read here before, water collecting near the foundation of your house is a recipe for disaster. An AC pipe like this can pump out several gallons of water a day, depending on the humidity. And Central Virginia summers are very humid! 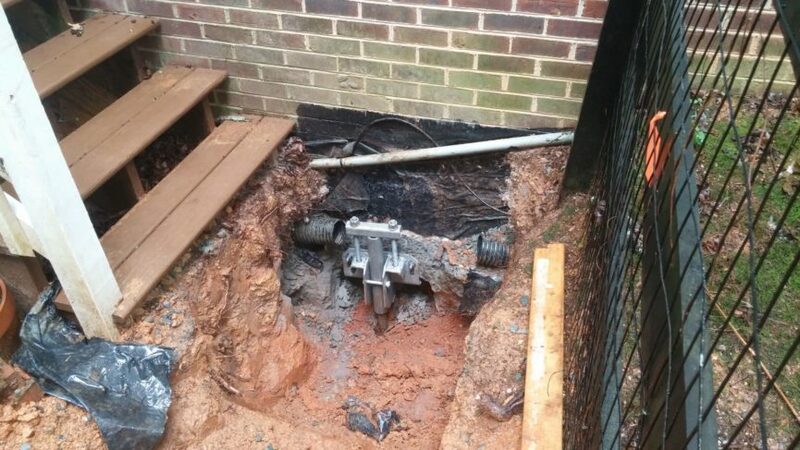 Installing helical piers in a tight space like under a deck poses unique challenges that certified AB Chance dealers and installers are trained to manage. Structural engineers prescribe the number of helical piers and placement; Reynolds Contracting follows their recommendations very closely to ensure the structural integrity of the foundation. This house has a dual zone heating and air conditioning system with two condensation pipes. The dual heating zones were connected and the condensation pipes were dumping together under the deck, doubling the volume of water against the foundation. As a homeowner, you should locate these pipes around your house. Make sure they are not dispensing water in an undesirable location! Single zone systems will likely have one pipe; dual systems like this residence can have two or more. We are happy to help if you cannot locate these pipes or are unsure where they should be draining. Usually, we work around existing structures, like decks, stairs, landscaping, and hardscaping. You can trust Reynolds Contracting with the job at hand, while also protecting the existing features around your home. Ultimately, we installed helical piers around the entire back of the house and under the deck, securing the back of the house for years to come. We also checked water flow and drainage around the house to prevent any future damage to the repaired foundation. You can count on us, the Central Virginia helical pier installer, for all of your foundation needs – big or small! Contact us today 434-293-6724 for an estimate.